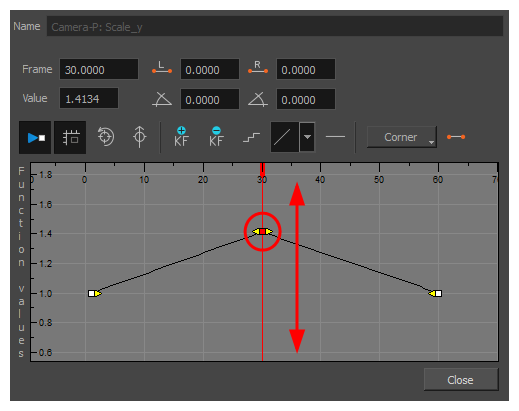 Once a keyframe is added, beside moving the image in the Camera view, you can change its value by typing it in the Timeline and Function views. Select the parameter for which you want to create a function curve. Wait until the cursor changes to a white hand with a two-way arrow and then drag the hand left to decrease the value or right to increase the value. Double-click on the blue number and enter a value in the field. In the Timeline view, open the peg element's parameters by clicking the Plus sign next the peg layer's name. 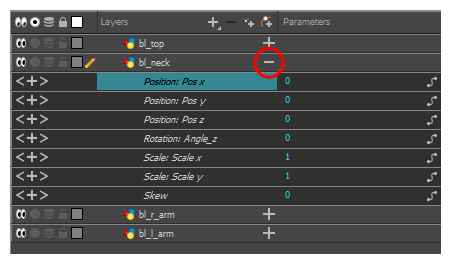 Double-click on the parameter layer name to open the Editor window or click once on the parameter layer to display it in the Function view. In the graph of the Function editor, select a white keyframe. The keyframe turns red and displays a pointed yellow handle. In the Value field, enter a value. You can also drag the keyframe up or down in the graph. Press Enter/Return or click the Play button to view the changes made in the Camera view. Keep adjusting the values until you are satisfied with the results.